Alive Kids is our children's ministry provided for kids ages 2 months-5th grade during service time. Each Alive Kids classroom provides fun, safe, and clean environment, with age-appropriate learning, for kids to make friends and learn about God. Our mission as a church is to help both adults AND KIDS know God personally & live for Him passionately. We know your child will have a blast at Alive Kids! Plan to arrive little early to securely check your kids in at our Kid's Check-in area in the main lobby. In our Alive Kids environments we focus on three foundational truths: God made me, God loves me, and Jesus is my forever friend. We know your child will have a blast and Sunday mornings at Alive Kids will soon be their favorite part of the week! We know sometimes planning to attend a new place with your family can be intimidating, so we have also included the information below to help you feel more prepared. Our nursery room is specially designed for infants and toddlers (ages 2 months - 2 years of age). Your child will love the trained teachers in this classroom and all the fun they have learning about God's love. Preschool-aged kids will love our Preschool room for ages 3-5 year olds. Preschool children experience an age-appropriate service with worship, video message, live teaching, small group break off and games! 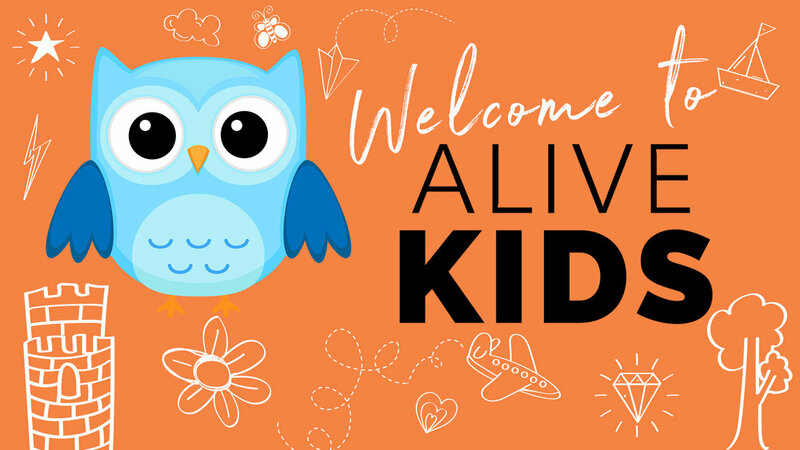 Kindergarten through 5th grade children will love our Alive Kids Elementary services! Full of interactive, age-appropriate learning to open your child's heart to God's love. The elementary experience has worship, video message, live teaching, small group break off and games & inflatable as well. We have security personal always posted at the entrance to the Alive Kids hallways, and no one is allowed into the Alive Kids Hallway without a security tag. Also, all staff and volunteers working in Kid areas must adequately qualify to serve in Alive Kids. Each individual has completed a thorough application, background check, and training to provide your family with security as you attend the worship experience. Our wonderful volunteers diligently adhere to proven and safe procedures relating to diaper changing, hand washing, and caring for children. Only women are allowed to change diapers. Alive Kids takes all possible steps to prevent sickness throughout the year. Toys and surfaces are sanitized before and after service. Tissue, wipes, and hand sanitizer are located in each room; volunteers and children are encouraged to use them frequently. Please refrain from bringing sick children to the classrooms to help us keep illnesses from spreading. Each class schedule is posted by the entrance to each room. We are intentional to create learning environments that are fun & age-appropriate, so that Kid’s can experience God’s love and learn about the Bible in interactive and impactful ways. A cheerios snack is provided during class in the Nursery room (for kids who are able to eat cheerios). And a goldfish snack is provided during class in the Preschool room. If a parent prefers for their child to not have this snack they can note that on the check-in sheet. If we need to get ahold of you during service for some reason, the Lead Teacher of the classroom will first try to text you. If after a couple of minutes we are unable to get ahold of you via text, then your child’s security number will appear on the screen in main service. This is your cue to promptly report to your child’s classroom. Alive has a great group of Middle School & High School age students! Currently, we have a Youth Crew that has quarterly social gatherings. If you would like your youth to join this crew email info@alivefamily.church or click here to sign-up and we can get you the deets on the next Youth Crew meet-up! Schedule your visit and a member of our team will connect with you and customize your visit. We will pre-register your kids and have their name tags ready when you arrive!